Achieving lifelike bass response from a subwoofer can be tricky. Achieving lifelike bass response from a subwoofer can be tricky. Reproducing truly accurate low frequencies — like the plucky depth of an upright bass — requires a combination of power, control, and finesse. The Revel Performa3 B110 weaves all three of these attributes together to create astonishingly accurate low-frequency performance. This sub is a worthy addition to any high-end stereo or home theater system. 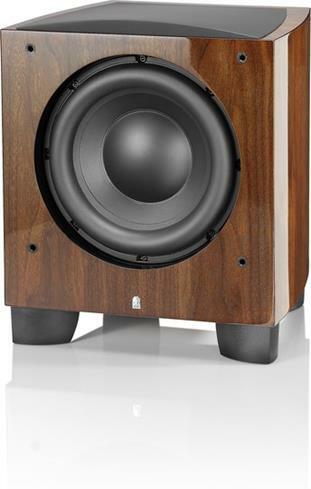 The Revel Performa3 B110 combines a 10" front-firing woofer with a massive 1,000-watt RMS amplifier for incredible bass output (shown in High Gloss Walnut). The B110 can shake the house, for sure. Its 10" front-firing woofer and titanic 1,000-watt amplifier are a powerful combination. But this sub really shines by producing lifelike bass at any volume level. It can provide whisper-quiet low-end effects, as well as tirelessly pound out deep bass at high output levels with next to no distortion. You get the best of both worlds. The B110 provides you with a high level of sound-shaping options that let you customize it for your room. Use the microphone built into your phone or tablet to measure the sub's output (this sub's owner's manual has recommendations for app options). Then connect the sub to your computer via USB, and run Revel's Low-Frequency Optimizer (LFO) software. This lets you dial-in the output settings and frequency curves to customize performance for your space. The LFO software lets you apply up to 10 independent parametric EQ filters to get the best response based on your sub's location and the room's acoustics. If you're using multiple subs, you can calibrate each one independently to remove bass peaks and dips. Have questions as you're setting things up? Free Crutchfield lifetime tech support is included with your sub purchase. 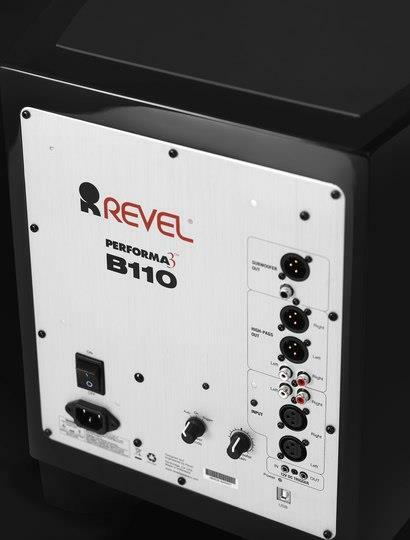 Revel's Performa3 B110 offers an array of connection options to optimize your setup. Most subs give you an RCA input or two and call it a day. But the B110 gives audiophiles a variety of connection choices to best suit their setup. This sub features balanced (XLR) and unbalanced (RCA line-level) inputs and outputs, along with XLR and RCA high-pass output connections. The Performa3 B110 also supports "daisy chaining" in a multiple-subwoofer arrangement, delivering a high-quality signal to each connected sub. Software Programmable Powered Sub: The Revel by Harman Performa3 B110 is designed to provide powerful and clear low frequency response. Featuring a 10" woofer powered by a 1000-watt amplifier, the B110 subwoofer reproduces deep, realistic bass with very low distortion, even at the lowest frequencies and high output levels. 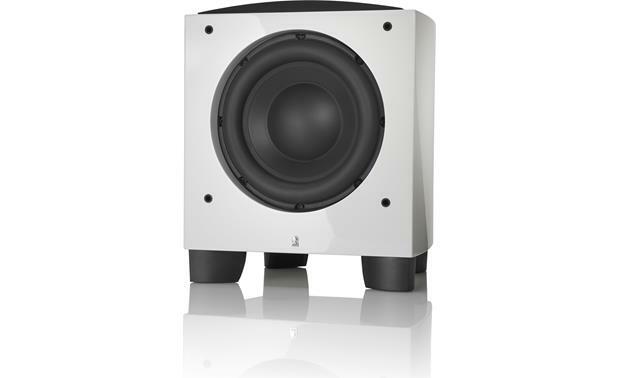 The Performa3 B110 powered subwoofer is designed to be used along with Revel LFO programming software (no Crossover, EQ or Phase controls found on sub). 1000W (RMS)/2000W (Peak) Amplifier: The Performa3 B110 powered sub's 10" woofer is driven by a built-in 1000 Watt (RMS)/2000 Watt (Peak) amplifier that delivers ample power and dynamic bass. 10"Anodized-Aluminum Woofer: The B110 houses a proprietary 10" anodized-aluminum cone woofer with advance technologies that increase its output, while eliminating distortion. Two-Layer Copper Voice Coil: The extremely long (50mm) two-layer copper voice coil gives this woofer a very high Xmax, dramatically increasing output. A fiberglass voice coil former helps the voice coil withstand high temperatures, reducing power compression and helping increase output. A cardboard spacer added at the top of the voice coil former maintains motor geometry, creates a solid attachment joint and prevents deformation of the voice coil at high outputs. High-Temperature Nomex Spider: A high-temperature nomex spider features a progressive roll design that evenly distributes mechanical stress, helping keep the cone's motion linear during high excursion operation. The woofer is also vented under the dustcap to aid in the exchange of air, which reduces acoustic losses and increases output. Nitril/Butylene Rubber Surround: A nitril/butylene rubber surround uses patented Plus One technology that increases the woofers radiating area (Sd), increasing volume displacement and output. Triple-Stacked Vented Ceramic Magnet Assembly: The woofer's magnet assembly features a triple-stacked vented ceramic magnet with flared vents that reduce turbulence, which improves airflow, increases output and reduces distortion. Dual symmetrical magnet shorting rings and an extended top pole create a symmetrical magnetic gap field that increases power handling and reduces power compression further increasing output. A 15mm-thick top plate improves heat and flux distribution for lower distortion. Cast Aluminum Frame: The cast aluminum frame is fully vented to minimize acoustic losses caused by excessive back pressure. This frame also maintains dimensional stability and precise mechanical tolerances, allowing the woofer to be manufactured and assembled to a high degree of precision. Rigid Enclosure: The subwoofer enclosure is formed with contiguous wood layers that prevent splitting. They feature strategically-oriented bracing that eliminates the possibility of enclosure-induced coloration. The beautiful, modern enclosure is finished in high-gloss piano black or high gloss walnut in a process (developed and overseen by Italian luxury cabinet makers) that exceeds automotive finish quality. Revel LFO Programming Software: The Performa3 B110 powered subwoofer is designed to be used along with Revel LFO programming software (compatible with Windows & Mac), which is available as a free download on Revel's website. The software configures the DSP processor inside the B110 subwoofer, which provides up to ten independent equalization points, each with user-determined frequency, amount of gain/cut and filter Q (bandwidth). This provides you with an extremely sophisticated way to optimize the subwoofer's performance for your particular installation, listening room and seating arrangement. In addition, the software also provides programming for the subwoofer's internal crossover system (50-200Hz), as well as speaker delay and polarity settings. All of these processing options can also be independently applied to the subwoofer's left and right high-pass outputs. To program the subwoofer's room equalization and high-pass and low-pass crossover characteristics through the Revel LFO software, you will need to connect the subwoofer's USB-B port to a free USB-A port on your computer that is running the Revel LFO programming software. Revel LFO is compatible with computers running Microsoft Windows XP (Service Pack 2) or newer and Mac OS X 10.6x (Snow Leopard) or newer. You will also need Audio Measurement Software and Microphone. Revel recommends the Studio Six Digital Audio Tools audio measurement app for Apple iOS 8.0+. Your Apple iOS device and the computer running the LFO software must both be joined to the same WiFi network to be able to export your measurement results from the iOS device into the LFO software. You must use the Revel LFO programming software to enable the subwoofer's internal low pass & high pass crossovers, DSP Equalizer, and Phase adjustment. None of these controls are found on the powered subwoofer, itself. The only controls on the powered sub are Power On/Off, Power Mode (Auto/On/Trigger), and Subwoofer Gain. Balanced/Unbalanced Inputs & Outputs: The B110 powered subwoofer offers both balanced & unbalanced connectivity - including Input, Sub Out, and High-Pass Out. All inputs & outputs are found on the back-panel of the sub. Inputs: The B110 powered subwoofer is equipped with balanced XLR and unbalanced RCA inputs to connect the LFE or subwoofer output of your AV receiver, integrated amplifier, or preamplifier. Both inputs are 0dBv (nominal)/+20dBv (maximum). The XLR input is pin 2 high. There is no dedicated LFE input, so you can use either the left or right input to make connection to your receiver's LFE output. 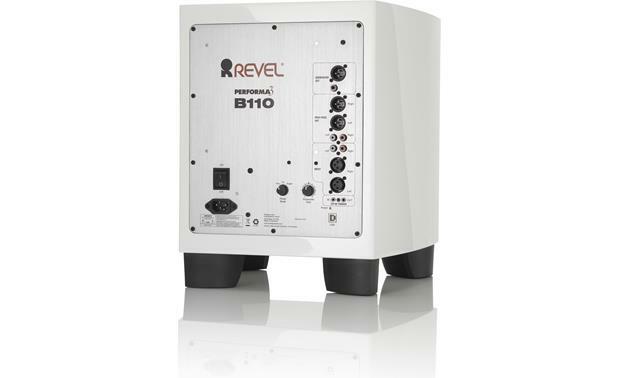 To accommodate connection to AV receivers with and LFE output and internal crossovers, the B110 is factory-programmed with its low-pass crossover circuit disabled. Sub Out: If you are using more than one Performa3 powered sub in your system, connect the Subwoofer Out connector to the additional Performa3 subwoofer's Input Connector. Balanced XLR and unbalanced RCA connectors are available. Both outputs are 0dBv (nominal)/+20dBv (maximum). The XLR output is pin 2 high. High-Pass Out: Use these connectors to send a high-pass filtered signal to the main (left/right) amplifier's inputs. Balanced XLR and unbalanced RCA connectors are available. Both outputs are 0dBv (nominal)/+20dBv (maximum). The XLR output is pin 2 high. The factory-default high-pass crossover setting is at 80Hz with a 24dB/octave (4th-order) slope. You can change these settings using the Revel LFO programming software. Note: Never connect or disconnect the connections on the subwoofer unless the subwoofer is powered off. Power Modes: A Power Mode switch on the back of the Performa3 B110 determines how the powered subwoofer will turn on and off. Auto Power On/Off: In this mode, the B110 will automatically power on when it detects an audio signal. It will automatically enter standby mode if no audio signal is detected for approximately 30 seconds to 120 minutes (set in Revel LFO programming software). +12V Trigger: In this mode, the subwoofer will automatically turn on when a voltage is present at the 12V Trigger In connection (3.5mm) and will remain on as long as the voltage is present. When the voltage at the 12V Trigger In connection is removed the subwoofer will automatically turn off. Always On: In this mode, the subwoofer will turn on and remain on until the main power switch is set to off. Note: There is also a main Power on/off switch located on the back of the subwoofer. Rubber or Spike Feet: The B110 powered sub features four integrated rubber feet for placement on hardwood, vinyl, laminate, and ceramic tile flooring. Four spiked feet are also included for placement on carpeted floors. The spikes screw into the the rubber feet on the bottom of the cabinet (there are rubber pads on the bottom of the integrated feet that will need to be removed in order to attach the spike feet). The B110 measures 17.6875" tall with the spike feet installed, and 17" without the spikes installed. Placement: When installing a powered subwoofer, be prepared to experiment with different locations to find the one that produces the best results throughout your room's seating area. Careful subwoofer placement can significantly reduce the peaks and dips in bass response. Using two powered subwoofers can eliminate these peaks and dips in bass response. 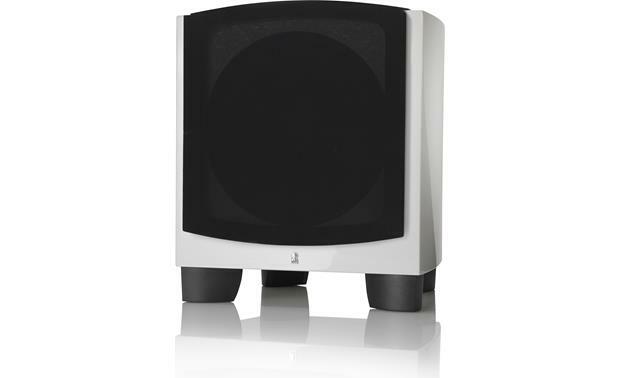 Searches related to the Revel Performa3 B110 Powered subwoofer with software-based equalization controls.